I needed a simple way to visualize the new FileMaker 13 themes and learn more about them. So I created a demo file as a design palette. This demo file explores each theme and visually shows the details of each layout object. You can see and experience how layout objects render for each state in a WYSIWIG like fashion. With this tool you can gain perspective on the consistency of your design as a whole. It's a great place to learn about FileMaker layouts and objects and experiment with building your own custom themes. When you open the demo file you will land on the home page. 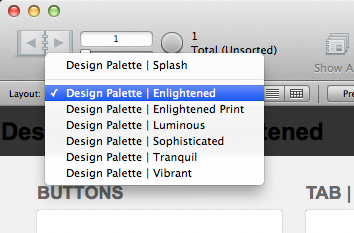 Click enter and you will be taken to a layout with the native FileMaker theme called "Enlightened". 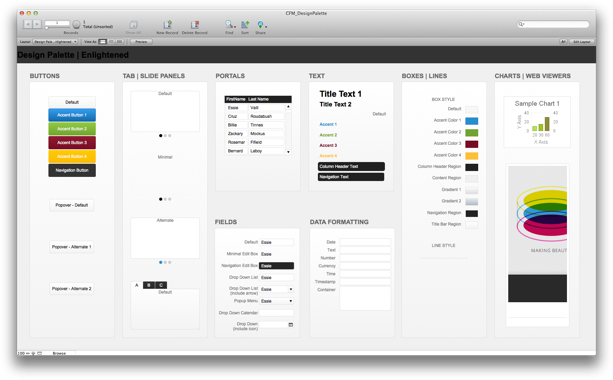 Use the Layout menu to review a series of the native FileMaker themes. Go into layout mode and try duplicating the "Design Palette | Enlightened" layout and change it to a different theme. Explore the style attributes and their naming conventions. The objects are stored in slide panels and they are grouped. You will need to ungroup objects to dig into greater detail using the FileMaker Inspector. Copyright (c) 2013 chiyofm, LLC All rights reserved. | Contact Us: info@chiyofm.com | 1708 W Chicago Ave STE 3 Chicago IL | Design by FreeCSSTemplates.org.